Donate Life Texas recently announced its 2016 delegates for the Donate Life Rose Parade Float. On New Year’s Day, Houston resident and kidney recipient, Monica Burnom will take the ride of her life down Colorado Blvd. in Pasadena, Calif. aboard the 2016 edition of the float, “Travel Life’s Journey,” Her mother, Marilyn, from the Katy area, will join her for this adventure of a lifetime. 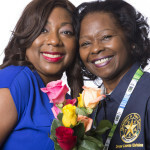 For eight years, Marilyn has been an employee of the Texas Department of Public Safety (DPS), an organization that plays an essential role in making donor registration easy and convenient. Today, Marilyn is a dedicated champion for donor registration after her daughter, Monica, endured a five-year wait on the national waiting list for the kidney she needed to survive. Since seats on the Donate Life Rose Parade Float are reserved only for transplant recipients and donor family members, Monica will ride on the float while her mother watches proudly from the Donate Life section of the grandstands. For more information, visit the 2016 Donate Life Rose Parade Float website.